As the 2016 Olympics are over and the main stadium has been transferred back to its regular manager Botafogo, the football club decided to reinvent its identity. The Alvinegro invested R$ 800,000 ($250,000) in upgrades. The seats installed back in 2007 were largely replaced and since Saturday the stadium has only black and white seating. In the lower stands they create a gradient, while in the upper decks they reflect jersey designs: black and white stripes in the east and solid black with club crest in the west. Only the north stand is different with black concrete terracing instead of regular seats. 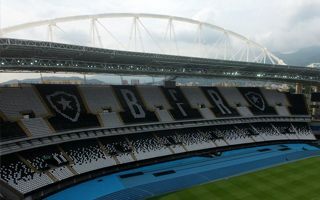 To finance the project, Botafogo invited supporters to personalize the seats. For R$50 everyone could have their name printed onto one of the seats, though without the option to select a specific seat. Still, the random prints proved very popular, attracting over 8,000 people. This was half of the cost was covered successfully. It’s no longer a neutral athletic stadium used by various football teams, it became a proper home to Botafogo and their fans. In fact, the running track was planned to by replaced by a black one, though the club eventually decided to retain the existing blue one. Officially to keep the Olympic legacy alive, after all Usain Bolt used to run here. But funding may have been a factor, too. Tomorrow the post-Olympic use begins for Estadio Nilton Santos. Not for Botafogo yet, because the first game is Brazil vs. Colombia. This exhibition friendly will see all revenue donated to Chapecoense, the club recently affected by tragedy near Medellin.